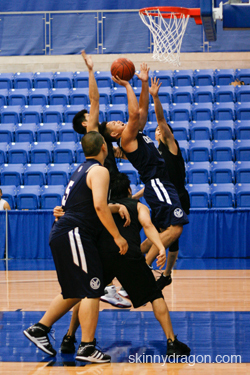 A record breaking 25 teams entered the 2009 Men’s Open division. The highly anticipated random drawing was held on Friday night, and the slate was set for Saturday’s Round Robin ballathon. Pool play stretched from 8:00am until 10:00pm on Saturday, with the action going on all day long at Nova Southeastern University. After the round robin portion, teams were seeded 1-25 based on won/loss record & point differentials; the top 16 teams would advance to the Medal Round, while the bottom 9 would compete in the Consolation playoffs. 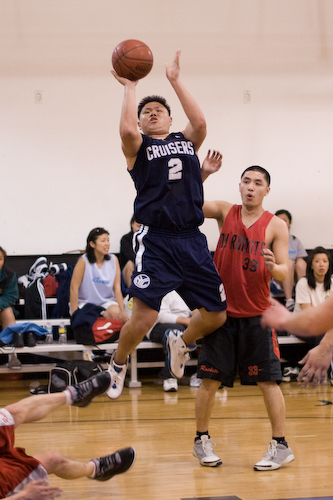 In the First Round of the playoffs, the #1 Chicago Dragons Wing Wor (2007 Runners Up) would meet the #16 Washington CYC B. All-NACBA guard Andrew Tsai (17 pts) hit 5 triples in the first 5 minutes to earn Chicago a quick double digit lead, and it looked like a typical 1st-16th blowout game was in the works. But CYC B was able to slice the lead to 5 by halftime, as Kevin Lee sank a big three and then converted on a couple of midrange drives. In the second half, Pat Chin and Damean Clinton (8 pts) took over the scoring for Chicago, as Washington could never overcome that 4-5 point deficit, and #1 Chicago won 49-41. Terry Callier paced DC with 11 points and 9 rebs. The #8/#9 game turned out to be a pretty low scoring halfcourt game between the Texas Ballistics and the NY RL Cruisers, although some may have thought that Texas would be pushing the rock up the court to take advantage of their faster frontcourt. The Cruisers were able to dictate the tempo in this one by making the Ballistics work hard on defense, and preventing the superbly talented Ballistics from getting out into their transition game. Texas’ 6-4 Norman Wang and 6-5 James Mao (16.3 ppg) did a fine job containing perennial All-NACBA forward Tony Hu, as Tony was only able to score 2 points this game. But by focusing all their energy on containing Tony, Cruiser sidekick George Chan (14 pts, 2-3 FT, 7 rebs) was able to roam free on the opposite block. The Cruisers maintained a 17-12 halftime lead, and in the second half the Ballistics just went ice cold from the field, hitting only 4 shots. The Cruisers maintained their steady pace, and finished the game off by nailing 10/12 free throws to advance 35-24. When the surprisingly effective #5 NY FBNYC Quicks faced the #12 Boston Hurricanes AAU (2004 Champs), no one quite knew what was in store. The FBNYC unorthodox formula of EZ-Pass defense, run and gun offense, and 1-on-2 three-pointers in transition had opponents baffled in pool play- as they had emerged with a 2-1 record and won both of their games by an average of 23 points. The Hurricanes came out well-prepared for this matchup by getting back on defense, rebounding the deep shots, and contesting every attempt. On offense, Boston’s primary weapons became 6-4 C Ricky Chan (8 pts, 9 boards, 1 steal) crashing the offensive glass for extra possessions, and smooth small forward Johnson Lam slashing to the hoop (15 pts, 11-12 ft). Boston took a 32-21 edge into the break. In the second half, NYC’s hero Harry Wang (All-Tourney, 14 pts, 2 blocks) dropped in 3 triples, and newly discovered F Shaun Young (12 pts, 1 trey) was also able to put some points on the board, but NY had no answer for the deep Boston bench as every Canes player got into the scorebook. Final score was 69-45, in favor of the Canes AAU. The undefeated #4 Toronto Dragons faced the #13 Cali Davis Davis Dynasty in the final game of the top half of the bracket. This game would feature a great matchup of two excellent PG’s-TO’s super quick Jordan Chiang and Cali’s Quentin Wu (a seemingly unstoppable 21.3 ppg despite a sprained ankle). But carrying such a heavy load on Saturday had an effect on Quentin’s Sunday play, as his 8 points and 4 fouls were not enough to continue the Cinderella magic against Toronto. The Dragons relied on the young legs of Andrew Suen (13 pts, one triple) and Kenny Ao (11 pts, 5-7 ft, 3 steals) to seal the deal, 41-31. On the other side of the bracket, the undefeated #3 SF Duke/Norcal Hoopaholics drew a tough first round opponent in the #14 NY Maximum Output (2008 Final Four, but missing absent star Nate Brown). New York looked like the better team in the first half, riding the momentum of a Dave Mason trifecta and 2 strong finishes from Alex Stewart to 20-14 halftime lead. In the second stanza, Norcal PG Alvin Lin used superior court vision to locate his teammates in positions where they wanted the ball, with Ryan Dunn (All-NACBA, 17 pts, 4 rebs), Dennis Yuen (5 pts, 8 rebs), and Conlan Kwong (two clutch 3’s, All-NACBA) finding their range. MaxOut lost their momentum, and the absence of top player Nate Brown proved to be a hardship for New York. Norcal advanced to the Quarters, 43-34. The #11 Philadelphia Suns A looked to advance to the Quarterfinals for the first time since 1998, as they faced the #6 Washington CYC A. Philly felt they had a shot to pull an upset, as they had gone 3-1 against DC since 2008 in local tourneys. But this was a different CYC team from the team that competes on the East Coast, as the roster has been overhauled and only a handful of players returned from last year. New adds included the well-known Hank Huang, slick scorer Huy Nguyen, and 2002 MVP turned model Daniel Liu. The contest began with combo guard Richmond Huynh (12 pts, 4 steals, 2 assists) carrying the Suns and keeping his team in the game at both ends, as his hustle for loose balls and quick trigger on offense were Philly’s key. Philly was able to find some mismatches on switches and get F/C Dave Ma (6 pts, 5 rebs) posted against 5-6 G Chris Lee. But you can’t go to the well too many times, as Chris was able to draw 2 charges within 4 minutes to quell the Suns run. By the half, DC had a nice cushion. The Suns made a 10-4 spurt at the beginning of the half, led by SG Andrew Young’s (9 pts, 1 block) steal and aggressive drive to the hole, and the lead was down to 12. CYC wasn’t rattled, as Hank Huang (15 pts, 3-3 ft, All-Tourney) scored on 5 straight possessions to put the game completely out of reach. CYC 55, Philly 32. The most anticipated pairing of the first round was the #7 NY USAB Warriors and the #10 Arizona Desert Jade. Both rosters were well stocked with athletic perimeter players. Arizona already had all-star caliber players in Dave Clarke, Phil Heu-Weller, and Steve Chang (2007, 2008 All-Tourney), and they went out and re-recruited high scoring sensation Sam Luong (2007 MVP for NY USAB Gold, who had added him after 2005 All-Tourney pick for Arizona DJ). USAB dominated the first half, leading 26-14 with Nick Mui getting to the hoop at will, and Zachary Liu popping jumpers in whenever the defense collapsed on Nick. Arizona only managed 3 field goals in the half, and missed every one of their long range shots. Luckily for them, Arizona hit 8 of 11 free throws or else the deficit would have been too much. Pitting Sam against many of his former teammates must have been somewhat difficult for him in the beginning as he only managed a single deuce in the first half. But in the second half, Sam got more comfortable, dropping 10 after the break. Arizona started to pressure the ball more on the perimeter, and take some risks on quick shots. Arizona took the lead, as USAB watched their lead vanish into thin air. The clearly pro-USAB fans began to fall silent as nervousness set in. With only seconds to spare USAB had the ball and dribbled from left to right on the court. They drove and swung the ball to Jason Chin, who hadn’t taken a shot all game. Jason had his feet planted right next to the sideline in the corner, as he released a shot that had a good rotation and sweet looking arc. As the ball descended, it looked like it just might go in- and the Spalding splashed through the net. The crowd went bonkers, as the game appeared to be headed into overtime, with the score tied at 44-44. Arizona regrouped, and had one last chance to avoid OT. They got the ball in the hands of Phil Heu Weller (9 pts, 2 treys, 3-4 ft, All-NACBAIT) who hit an off balance 3-point jumper and Arizona Desert Jade won a real thriller 47-44. Arizona would face the #2 Seattle Bladerunners- #15 Toronto Kagers winner. Seattle came out like it meant business. The Kagers were concerned about Jim Shih’s interior presence, but it was actually pointman Austin Yuen (11 pts) and Wesley Hsu (9 pts) who began the game by flexing their might against the Kagers defense. The game started off as being contested, but a couple of Toronto turnovers led to easy buckets for Seattle. With the lead safely in double digits before halftime, the Bladerunners were able to rest most of their starters for the next game as they put it on ice, 54-37. Tim Wang had 14 points and 4 threes for the Bladerunners, while All-Tournament pick Eric Liao had 13 for Toronto.